Th United States now averages at least a school shooting per week. The United States has 5% of the world's population, but sees about 31% of the world's public mass shootings. The United States has 42% of the world's guns. Per million, the gun homicide in the US is 33. For Canada and Britain, it is 5 per million and 0.7 per million respectively. A new Yorker is 54 times more likely to be killed with a gun than a Londoner. And it isn't getting better. 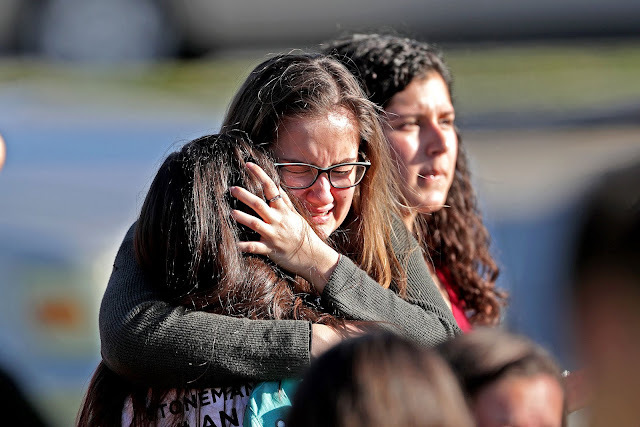 Two of America's deadliest mass shootings happened just 35 days apart last year and yesterday's Florida shooting has joined their rank as one of the deadliest in the country's history. Infact, an FBI study indicates mass shooting in the United States is increasing by the year. The Florida mass shooting is the 18th one in the USA this year. And that statistics reveals a level of atrocity unmatched anywhere else in the world, with Yemen the only country close to the US. Yemen also have the distinction of being the second after the US when it comes to guns in circulation. And if you contrast that with the remainder of the advanced world, it even makes for a more disturbing read that shows the United States as the sole country amongst them all with this level of violence and death. Someone in any US City is 50 times more likely to be at the end of a gun homicide than anywhere else in the advanced world. I won't go into what the solutions are, or even try to speculate about any - that is the job of the US Congress even though it is something they have refused to do, or even try to do, for personal and rather selfish reasons. Not long ago, there was the argument that brewed in this clime over the rightness, or otherwise, of Trump's statement about shithole countries, of which Nigeria was one. But for what was deduced or was made of that statement, rightly or wrongly, the fact remains, that a child is less likely to be gunned down in a school in Iyana-Ipaja, Lagos, or Maputo, even Haiti, than the child would in any US city. That is another level of shitholesery the United States should embrace. Until a solution is found at least. Yet, the overwhelming response from those saddled with the task of putting a stop to this atrocity is "our thoughts and prayers..."
That is something you would expect from politicians from a shithole country, where "prayers" - whatever that means, have replaced meaningful, solution focused discourse. It is what you expect from a country with little or no moral compass to tune the leaders' senses to the right side of history and not the other side, filled with naked ambition and sefishness. The other side also leads to a broken nationhood where no one feels safe. And that is the definative meaning of a shithole country.